Driving past the woodsy grounds of the US Naval Observatory on Massachusetts Avenue, you can't help but notice the prominent "USNO Master Clock" displaying the time in bright red digits. That is part of their mission, after all, to "determine the positions and motions of celestial bodies, motions of the Earth, and precise time." How exactly do they do what they do? And who are these modern day keepers of time and celestial motion? In the physics and engineering department at MC, we are particularly lucky to have Amy Fredericks as an adjunct astronomy professor, teaching the evening section of our Astronomy 101 course. 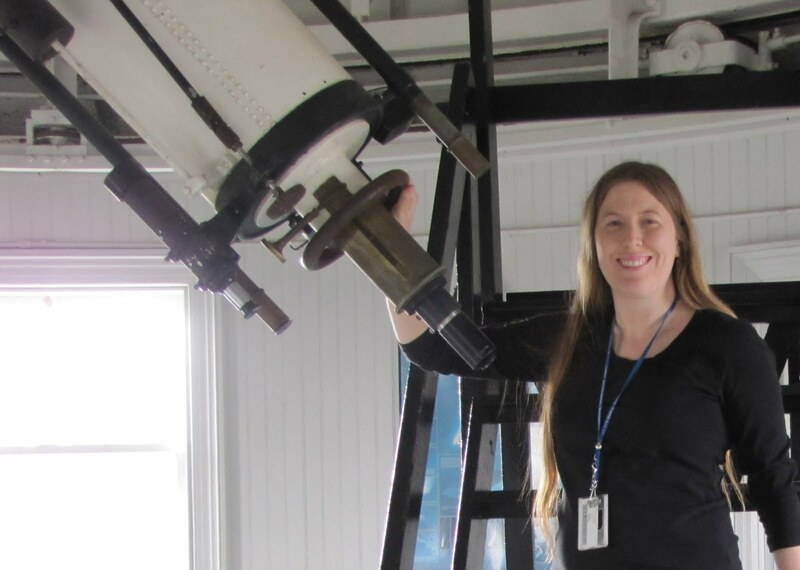 Not only is Amy a dedicated and enthusiastic instructor, she is also a real live astronomer at the US Naval Observatory! For students who have wondered how I set the times of the Observatory Open House nights (I base it on when civil twilight ends), or how I know how much of the Moon's visible disk is illuminated (81% last open house), well, I owe it all to Amy and the USNO Data Services. :) If I were a leprechaun, the data services portion of the USNO website would be the pot of gold at the end of the rainbow. It's even better though, because the data services page is super easy to find. Have you ever wanted to know more about what goes on inside the USNO and what goes into maintaining something as complex as the data services? Amy was generous enough to satisfy our curiosity about what she does during the daylight hours. Q. I know you as our brilliant and intrepid evening astronomy instructor at Montgomery College, but you have a whole other life at the US Naval Observatory. How long have you been there, and what do you do? A. I have worked at USNO for 6 years, in the Astronomical Applications Department. You could say I'm both an astronomer and a computer programmer. My department, working in concert with Her Majesty's Nautical Almanac Office in the UK, produces the Astronomical, Nautical, and Air Almanacs. I work in the AA Department's Software Products Division, which produces software and web applications related to the almanacs and also astrometry and celestial navigation. I maintain the web applications and assist in the testing and maintenance of all our software products. Our website is http://aa.usno.navy.mil/. Q. Is there a typical day for you at work? If so, what is it like? A. A typical day may include making updates to our website or our data services, attending status meetings on the latest upgrade to one of products, or helping to get that upgrade ready by testing it. Q. The USNO in Washington, DC has telescopes. What kind of telescopes do you have and what are they used for? A. The biggest telescope we have in DC is the 26-inch refractor. It is the telescope that Asaph Hall used in 1877 at our old Foggy Bottom location to discover the moons of Mars. It is still used today (despite DC's light pollution!) to study double stars and the moons of the outer planets. We have a few smaller telescopes that are also used for research. Our "dark sky" site is USNO's Flagstaff Station in Arizona. That's where we have some big reflecting telescopes that are used for viewing fainter objects than we can see from DC. One of them was used to discover Charon, the biggest moon of Pluto, in the 1970s. Q. What is your favorite thing about being at the USNO? A. Our products are used by the military, the scientific community, and the public. I love being able to support all of our users. And, of course, I love the people I work with at the Observatory. Q. Are you ever able to bring what you do at the USNO into the classroom? A. Sometimes I make passing references to it but not too much. I'm always trying to think of ways! I know friends at other colleges have assigned their students to use our website in their homework. Q. The USNO is also the official residence of the vice president, so I have to ask...in all the time you've been at the USNO, any vice president sightings? A. Sadly, no! Just his helicopter and motorcade on occasion. He does use our library for news interviews, so the librarians probably see him the most. Congratulations and best wishes Amy!